Connecting with inspirational role models is one of the joys of traveling on my journey with Breast Cancer MyStory. 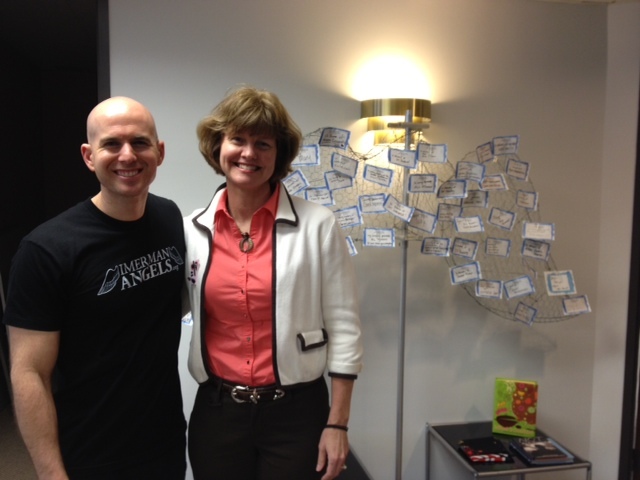 Today’s blog captures the conversation I had with Jonny Imerman, Founder of Imerman Angels in Chicago. Jonny was diagnosed with “non-seminoma” (many different types of cancers) testicular cancer at the young age of 26. Going through diagnosis and treatment, Jonny became painfully aware that nobody with his disease “looked” like him. Because Jonny’s circle of support was strong and present, he wandered around the hospital with an IV pole while getting his chemotherapy and witnessed many people going through treatment alone. Jonny being Jonny, he thought that wasn’t right and set out on a personal mission to connect with those going through cancer who needed a survivor as a mentor and role model. He thought, “What if every cancer fighter could talk to a cancer survivor who not only had beaten the same type of cancer, but who also was the same age and gender as the fighter?” This thinking became the foundation of the future Imerman Angels non-profit. Through his early gestures of kindness and interaction, Jonny quickly learned how powerful the survivor voice was to someone going through cancer. That’s when the thought struck him that he could mentor one on one, and believed there was a scalable model behind his actions. Lining up people with cancer and a mentor survivor became a personal matching quest for him starting in 2005. By 2006 the part-time passion became all-consuming. Jonny left his full time job and officially started Imerman Angels. In short order, the matching task became bigger and more complex; he realized he needed help and hired his first employee the summer of 2006. Today, Imerman’s Angels has a full time staff of eight employees, six of whom are survivors. No longer does Jonny do the match making in his head or on his laptop – the organization now uses SalesForce.com to maintain information and assist with their matches. Through gradual growth over the past seven years, Jonny has lead with his heart and believed in his mission of one to one matching. His organization has focused on three areas to spread the word and make connections: 1) hospitals 2) cancer partner agencies 3) pounding the pavement. Currently Imerman makes 62-100 family matches per week and over 1,900 in 2012. Each match costs $350 and the organization connects people with hundreds of types of cancers from around the world. Interested in being an angel mentor? Simply apply at http://www.imermanangels.org or phone (877) 274-5529. After you fill out the application, someone from Imerman contacts you to talk through what being a mentor angel is all about to make sure you are a good fit for the program. Once you are approved, you’ll wait until a cancer patient who “looks” like you reaches out for support. Your profile at Imerman and a match with a cancer patient triggers a phone call to you, the angel, to get the ball rolling. If you are a cancer patient looking for support, simply visit the same website or call and they’ll work on getting you a match right away. The service is free for anyone in the world. Also remember if you are a caregiver, there are matches for you as well! Phone lines are open and Jonny wants everyone who seeks help to reach out as support is waiting.